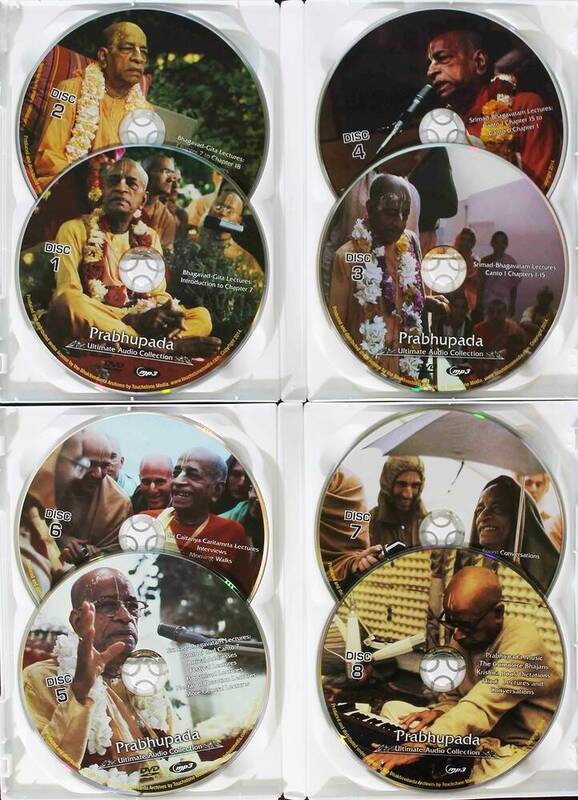 The best quality Prabhupada recordings ever released, on 8 dual-layer DVDs. NOW AVAILABLE ON USB STICK / THUMB DRIVE. Contains over 1400 hours in more than 2500 MP3 recordings of high quality audio. All digitally enhanced. In a beautiful boxed Set. Dramatically improved audio quality. Includes entire kirtan and bhajan collection. Greatly Improved ID3 tags. 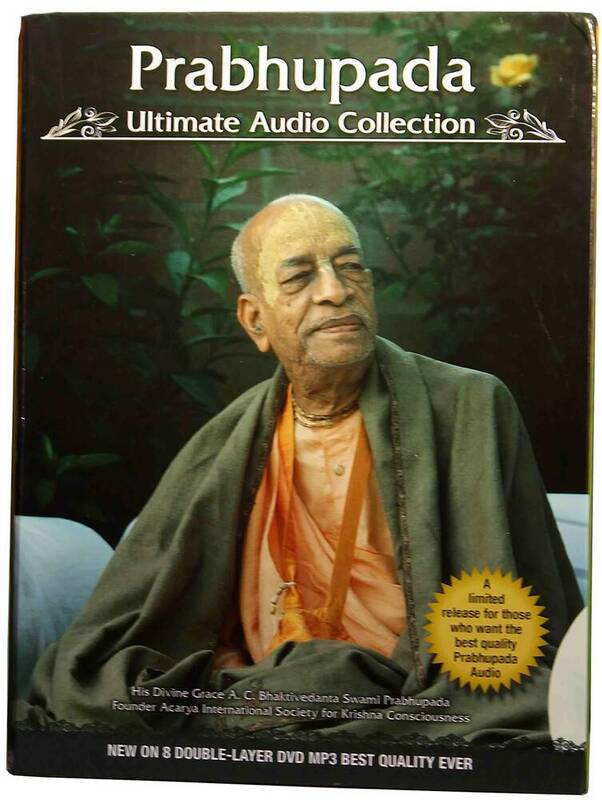 A beautiful 8 DVD-ROM Boxed Set containing over 1,200 hours of Prabhupada's lectures, classes, morning walks, room conversations, and discussions with more than 100 hours of kirtans and bhajans in high quality 128 Kb/sec MP3 Format. This Prabhupada Ultimate Audio Collection contains all of Srila Prabhupada's lectures, conversations and bhajans and kirtans presented for the first time in 128 Kb/sec high quality MP3 files on 8 dual-layer MP3 DVDs. 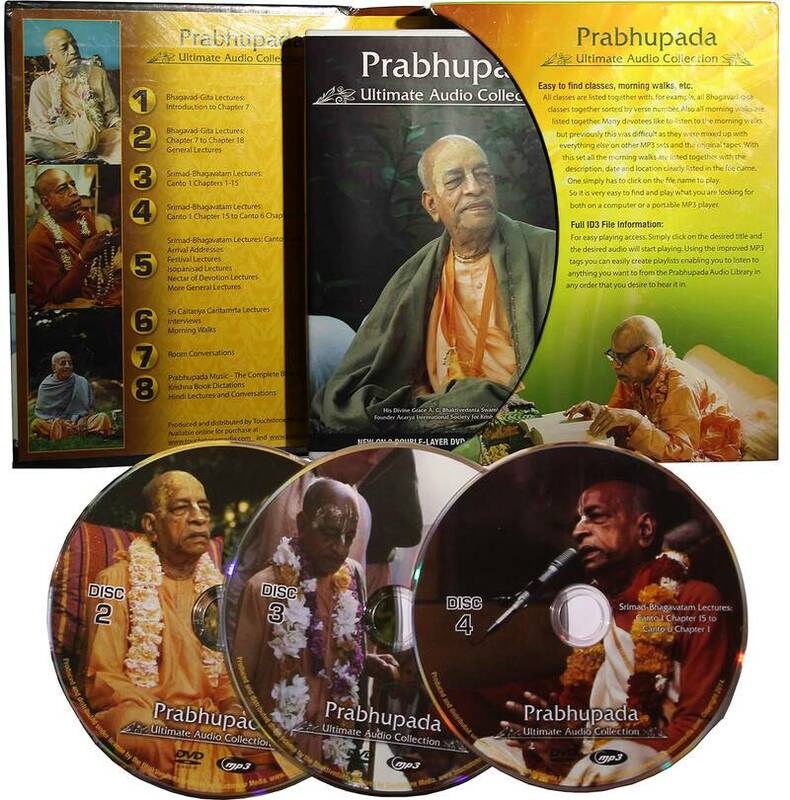 Previously we had to release the Prabhupada MP3 set on CDs with limited storage capacity. We were forced to limit the quality to 24 kb/sec. But now, with DVD-ROMs, we can distribute the Prabhupada audio in the best possible 128 Kb/sec quality. Includes the entire kirtan and bhajan collection featuring more than 40 Music CDs of Srila Prabhupada.